Every now and then, in between planning worldwide travels for my jetsetting clientele, I take a break and hop a plane to a favorite destination of my own. And, as with my clients, I often choose my destination based on convenience (one nonstop flight under six hours), warm weather, and a comfortable combination of luxury hotels, amazing food, and gorgeous scenery preferably by a beach. 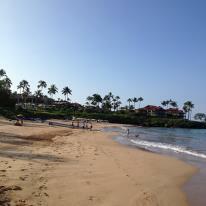 Most recently, I chose Maui for a relaxing birthday weekend getaway. 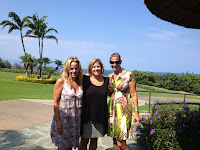 Joined by a longtime friend who was also in need of R&R, we headed to Four Seasons Resort Maui at Wailea . 1) Sign up for Surf Lessons with Al at Maui Wave Riders in Kihei. 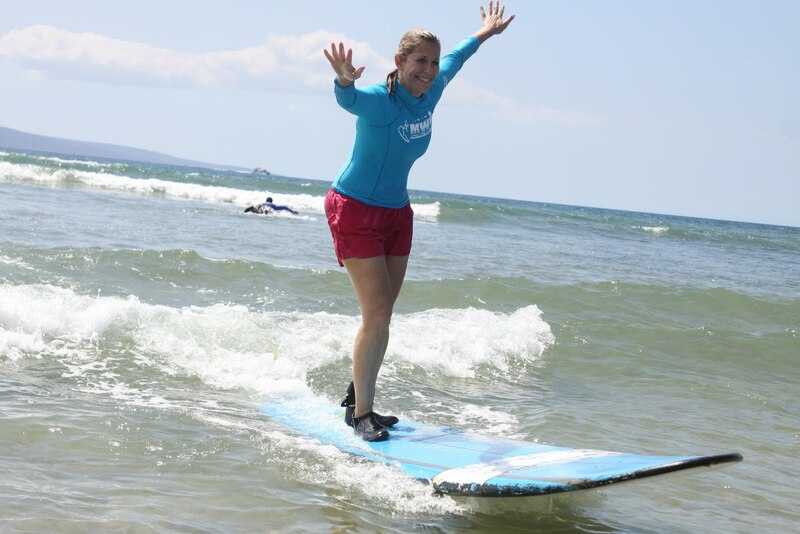 Standing up on a surfboard was on my bucket list for years. If I could do it, pretty sure anyone can with the proper coaching from Al and his Kihei-based team! 2) Stroll through Paia town and you'll quickly see why it's called Maui's "coolest little town". 3) Dine at Mama's Fish House, one of my favorite dining experiences anywhere in the world. Highly recommend any of the fresh fish dishes, coconut lime refreshers to drink and Kula pie for dessert. 4) While staying at Four Seasons Maui, indulge in their amazing health/fitness offerings. My favorites included aqua aerobics in the fountain pool with Brenna; yoga by the sea with Bob; and a cranio sacral massage in the spa with Patricia. 5) Take a scenic drive across the island and head to the stunning Ritz-Carlton Kapalua for lunch by the property's poolside oceanview cafe . Chances are high you'll also fall in love with this beautiful, authentically Hawaiian-styled hotel, so think about combining your Four Seasons Wailea stay next time with a bit of quality time here in quieter Kapalua. (Note: To me, it's the perfect combo and one we recommend often to our clients wanting a diverse experience without island-hopping). 6) Sushi at San Sei is always fun. The original location, opened in 1996, is walking distance from the Ritz-Carlton Kapalua and the other--a few minutes by car from Wailea in Kihei--attract a mix of locals and visitors for traditional and award-winning "new wave" sushi and Japanese dishes. Every client I've ever sent here always raves. The same is true for Mala's Ocean Tavern, overlooking the Pacific Ocean in the heart of Lahaina on Front Street. 7) No trip to Maui is complete without indulging in Shaved Ice. This Hawaiian tradition (think sno-cone but 1000 times better) is the perfect post-surfing or late-night treat. Lots of great spots island-wide but UluLanis original location in the courtyard off Front Street downtown Lahaina is one of the best. 8) Sunset cocktails and live music on the oceanview rooftop deck are two reasons a stop at Mick Fleetwood's on Front Street is a must. Great food, an extensive wine and cocktail list plus incredible views and a fun ambience make this my top choice for Sunday afternoon/evenings in Maui. As a Preferred Partner of Four Seasons and a STARS agency with Ritz-Carlton, we have exclusive offerings at both properties with best possible rates including breakfast, VIP perks and added amenities ranging from hotel credits to priority upgrades. For more information on planning your own Maui getaway, feel free to email me at Stacy@elitetravelinternational.com. 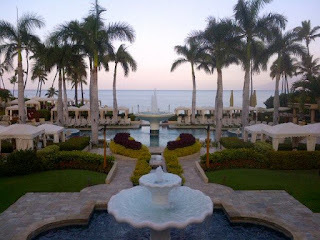 We went on a vacation in Maui last summer and stayed at Four Seasons too. Let me just commend the staff there, they were very friendly and accommodating, making our stay truly pleasant. We stayed there too Karleen. I agree, the staff were all nice. And I must say the hotel is just as nice. Their amenities were great, the room and the bathrooms were really clean and beautiful. Wow! The whole place just looks amazing and promising. I think it'll be worth the visit for the summer, should I go call now and reserve a space for me and my family? What I love most about the place is its ambiance. It's so relaxing especially since it is surrounded with beautiful gardens and a pool that overlooks the beach. I wish I can go on a vacation to Maui too, it's been a while since I went on a trip. I guess I needed a time off from everything and have a "me" time. Even a camping or a road trip will do for now. Yeah maybe I'll do that, just jump off in our camper van drive off somewhere. Maui seems nice. It's too bad we already have plans this summer. We're going to invade Costa Rica! Hi Karleen, we stayed at Four Seasons too and I have to agree, it was the best choice for a hotel to stay in. Their amenities are great especially the pool where my kids spent most of their time. It's extremely enjoyable reading your post, i have gather sufficient concepts for my travelling ideas. serviced offices india As for me, I love visiting places and also making each place a memorable one. So have luxury yacht hire to your travel stuffs. You did a pretty good idea in handling details for your clients about how you experienced the best places in the world first-hand. Have you tried traveling with an RV? I think there is no better way of experiencing the nature but through camping and driving on a long trip. That is awesome. That's all that I could say. I am dreaming to go in a place like that, where you can relax and unwind feel the ocean breeze and smell the scent of nature. This is a great blog, love the article as well. I just learned how to surf the last time my family and I went to Hawaii. It was so much fun and I can not wait to do it again. I have never been to Maui though but I heard it was beautiful and the beaches are great. I love going to the beach so destinations like these are always a winner. Since I enjoy beaches so much I also take a lot of time in picking out the best sunscreen since I have fair skin. I like to use All Natural Sunscreen because it is because it is strong and is not bad for your skin. Since I usually have to have it on all day, I want something that is not bad for my skin. How I wish I could also own my own version of this resort. I think I will start with adding more lights in the garden area to make it more romantic and more appealing. Jam Tangan Online Murah of great information and inspiration, both of which I need, thanks to offer such a helpful information here. Thanks more information Best company Export Warehousing and storage services for all types of things with Car carrier and moving services. Thanks more information top company provide for Export 5th Packers and Movers Complete moving and packing services for home/office and corporate relocation. That was really enjoyable blog for me thanks for sharing this. It is a very good Blog Topic. Nice article. You can celebrate new year with beautiful quotes. There are QuickBooks Point Of Sale Support Number users who face unexpected errors during the initial installation of the POS software. Sometimes the issues might become so critical that it affects daily back up issues, POS printer issues, inventory report issue, POS migration errors, server issues, cloud and barcode issues. Here is the 24*7 Support for your Quickbooks. Call our QuickBooks Technical Support 1888-396-0208 and get QuickBooks Technical Assistance instantly. Your call will be quickly transferred to a customer support representative. Our average response time is 10 seconds. Get in Touch with us. Quickbook Technical Support Number 1888-396-0208 offers industry-particular arrangements, strikingly for temporary workers, assembling and discount, philanthropies, and retailers. Quickbooks endeavor bolster stands special in the market as it has the best instrument which can help us to settle our any sort of Quickbooks related issues. They help to determine our concern in a split second and effortlessly. Quickbooks Support stands unique in the market as it has got the best tool which can help us to fix our any kind of Quickbooks related issues. QuickBooks Support Phone Number 1888-396-0208 offers industry-specific solutions, notably for contractors, manufacturing and wholesale, nonprofits, and retailers. They help to resolve our problem quite instantly and easily. Pick your phone and dial our toll free number anytime, We are here to help you 24/7. Call Our QuickBooks Enterprise Support phone Number 1800-291-2485 is offer the service: QuickBooks Error, QuickBooks Backup, QuickBooks Software Install & Update, QuickBooks Drivers, QuickBooks Enterprise, QuickBooks Payroll, QuickBooks Premier, QuickBooks Pro Adviser, QuickBooks Troubleshoot, multi use mode issue or any kind of technical & functional issue.